Basically, second verse...same as the first! Like the tool pouch I made for the carving tools, but this is for my two Wetterlings. 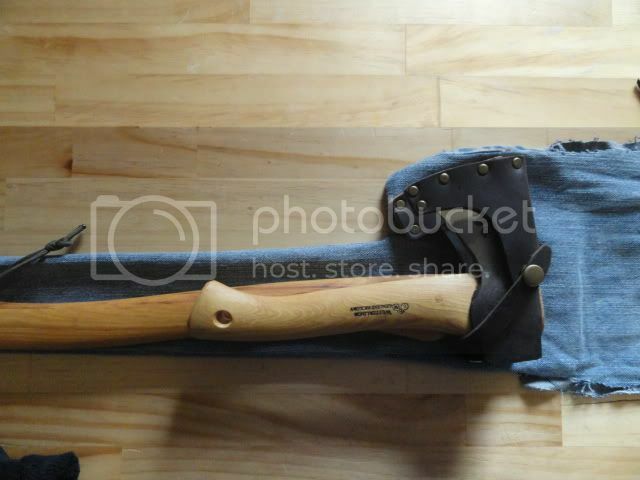 The smaller hatchet helve is covered by an old sock, and the head is covered by one of the flaps to protect the two sheaths. They just stack together, but it protects the helves when I put them inside my pack as opposed to carrying on the outside. This is basically just practice with the sewing machine I bought, figuring out thread tension, how to adjust stitch spacing and all that....got a LONG way to go for sure!! I realize these pouches are nothing to brag about, mainly to show what can be done on a limited budget and a little time... 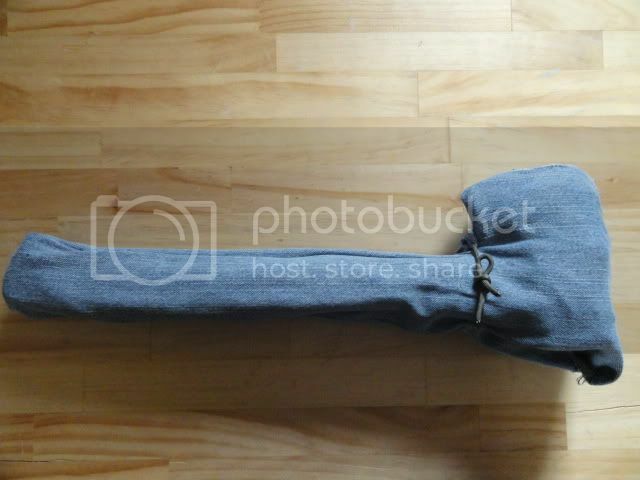 The jeans were free, the old sock was....old, and the paracord tie was from a scrap piece. It took longer to read the sewing machine manual than to put both pouches together. Nice way to recycle old materials. 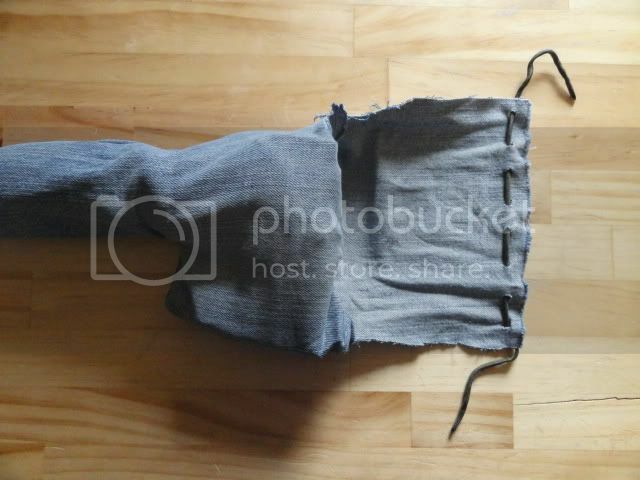 the last pair of jeans I wore out got turned into charcloth. But this looks like a longer lasting use for them. I'd like to maybe make a sleeve to hold my hawk handle with the head removed some time. Thanks! These were mainly playing with the sewing machine, but I do like re purposing things if I can. I've often wondered about making a leather sheath that could be carried on my belt for the CS trail hawk head I've got and throw the handle in the pack in one of these slip covers. That would be a neat sheath idea. I made a leather mask for my trail hawk head, and I just toss it in the pack, but it would be neat to make one with a belt loop. 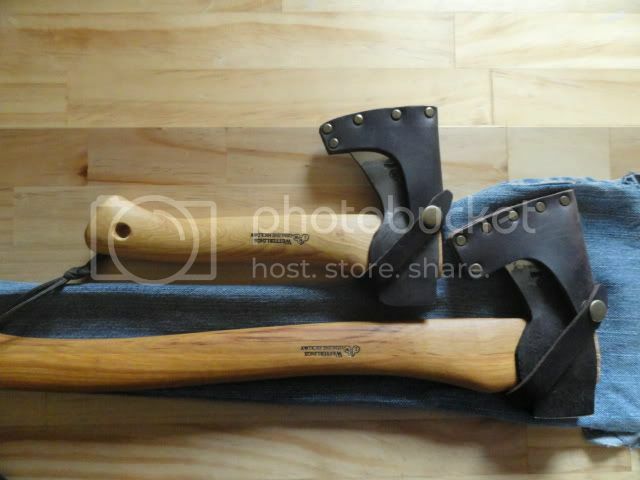 If you've ever seen the one the Estwing hatchet comes with, it might be a good place to start for working up a design. Though I think those might require the handle to hold everything in place. I made a mask and a separate belt carrier thing that will carry it or the Wetterlings, but the sheath idea would be good. You could draw it for rougher things like digging out pine sap and things and leave your knife cleaner. Lover of Navaja's & all things Sharp! Just a Darn Good Idea Danno! Very Smart Stuff! Pant legs make great pouches for lots of stuff. Thanks for showing this!